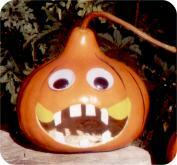 The neighborhood 'Friends of Pumpkin Substitutes' society site you for not planting your gourds earlier. They now have to resort to the same-old same-old Jack-O-Lanterns for their Halloween celebration. You are out $100.00 for their fee and get "tricked" for Halloween this year. So sorry! Now, you realize that Fall is NOT the time of year to plant gourd seeds.